If you're looking to give your bathroom a quick injection of class and style, a plug-in towel warmer is the way to go. With a relatively easy installation, plug-in towel warmers provide a comfort like no other, pleasing the eye while soothing the soul with a warm embrace. There's a huge variety of plug-in towel warmers to choose from, so it helps to know what options exist and which ones you should consider. We’ve laid them out below in a straight-forward fashion so it’s as easy as possible to get the plug-in towel warmer of your dreams. Once you’re done learning about your options, find the towel warmer you want by using the table at the bottom of the buying guide. Whether you want the height of modern style or an elegant, traditional feel, there’s a plug-in towel warmer out there to match your décor. While our online catalog already boasts the 16 most popular finish and color options, some models can be special ordered in over 100 additional colors if you’re in search of that perfect match. But style’s not all about color. Since it often stands out as the focal point of the room, your towel warmer should express the mood you desire for your space, and there are ample options to choose from. 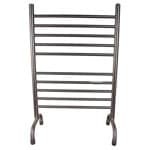 Traditional towel warmers have simple, straight bars, but there are many models available with curved or bowed bars, as well. You can find ornate towel warmers with wooden frames and towel knobs, or you can go extremely minimalistic with a model featuring a few steel rods giving off plentiful heat. There are towel warmers with soft bends, exuding relaxation, and still others with a sturdier, industrial feel. There are even towel warmers with bars that swivel for maximum use of space. No matter the style you’re looking for, there’s a plug-in towel warmer out there to bring out the best in your home. Deciding where you will put your towel warmer is a critical point in the buying process. There are two mounting types for plug-in towel warmers, wall or free-standing. 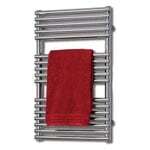 Wall-mounted is the most popular style of plug-in towel warmer. Although it may seem obvious, it is important to make sure you find a large empty space on the wall that is near an electrical outlet to avoid additional installation expenses. You may also want to consider the material your wall is made out of and if it can withstand the weight of a towel warmer and the wet towels that will be added to it. It's always safer to mount the towel warmer to studs, if possible, to ensure stability. Free-standing plug-in towel warmers are great if you don't have sufficient space on your wall. Because these towel warmers simply stand on the ground and don't require mounting of any type, they can be placed wherever you find most convenient for you. Want a warm towel waiting for you at the foot of the bath? No problem! 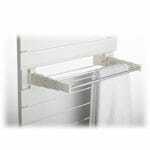 Free-standing towel warmers offer excellent flexibility if wall mounting is not practical or desirable. Some plug-in towel warmers come with no control mechanism whatsoever and require you to purchase, at minimum, a basic on/off switch in order to complete your install. Most plug-in towel warmers, though, come with a default control mechanism. The most basic control is on/off, which simply allows you to flip a switch when you want to start heating up your towels. Some include low/med/high controls, which let you adjust the temperature to three distinct levels. For ultimate control, almost all plug-in towel warmers have advanced programmable controls available as optional accessories. For a mix of function and style, plug-in towel warmers can be accessorized to assist with drying specific or extra materials. From robe knobs to drying racks, towel rings to towel bars, there's a way to warm all your linens. Use our table below to view plug-in towel warmers that fit your space. 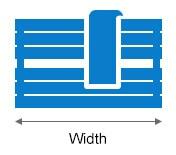 Just click the link in the appropriate size range to see the products we offer. Most styles of towel warmers come in a variety of sizes, so you shouldn’t have a problem finding the right one for you in the size you need. If you aren’t happy with the styles you find in one size, try checking one size smaller or larger. Sometimes sacrificing a few inches in height or width can give you style that will keep you smiling for years to come. Select Height30 - 35" 35 - 40" 45 - 50" 55 - 60" 70 - 75"
Select Width15 - 20" 20 - 25" 25 - 30"
If you're still not sure what size plug-in towel warmer you want, you can view all of them by clicking the link below. Since towel warmers are effectively stylized radiators, you can choose to have your towel warmer also serve as an auxiliary heat source for your bathroom. It's a great option for bathrooms with poor heating and can be more energy efficient in place of turning up the thermostat every morning to heat every room in the house. If you elect to go this route, make sure you size your towel warmer based on the BTU it can provide your space. 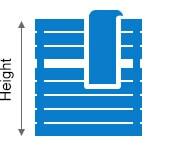 To find out how many BTU/Hr you need to effectively heat your room, use our sizing tool below. 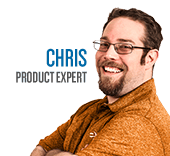 Plug-In Towel Warmer Buying Guide - How to Pick the Perfect Plug-In Towel Warmer. 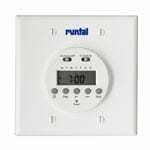 Our heating, ventilation and cooling equipment how-to library can help you pick the perfect comfort solution for your home.